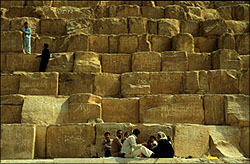 More than 2,300,000 limestone and granite blocks were pushed, pulled, and dragged into place on the Great Pyramid. The average weight of a block is about 2.3 metric tons (2.5 tons). How much is that? Well, you can think of it in terms of refrigerators. An average refrigerator weighs about 91 kg. If 1 metric ton = 1,000 kg, how many refrigerators equal a 2.3-metric ton block?